Have you met Tony Braunstadter? 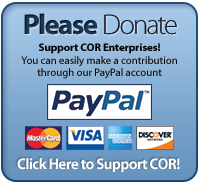 He arrived at COR Enterprises in July of 1986! He started in our janitorial department, and after a year, he moved over to maintenance and delivery. In 2000, he took over the Wood Shop. Our Wood Shop manufactures stakes, laths, hubs and a variety of other products for several area contractors and members of the community. Tony manages a crew of 7 individuals as they operate saws, test quality and prepare products for our customers. Tony enjoys combining his love for woodworking, building projects and working with our clients. Tony says that he particularly enjoys building special order projects like sheds. He manages a consistent base of 20-25 customers. Tony enjoys fishing, camping, riding his motorcycle and working outside in the yard and garden. If he was stranded on a desert island, he only needs two things: a radio to listen to music and a fishing pole! This entry was posted in Uncategorized on April 27, 2016 by Jodi Mackay. This entry was posted in Uncategorized on April 25, 2016 by Jodi Mackay. Our deepest sympathies and condolences go out the the friends and family of Michael Lucero. His smile and mischievous personality will surely be missed. This entry was posted in Uncategorized on April 18, 2016 by Jodi Mackay. Have you met Leigh Ann Olson? If you’ve stopped in between now and 1983, you’ve probably run into her! 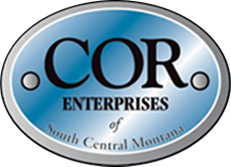 She did her internship at COR Enterprises, while completing her degree in Psychology from Eastern Montana College. After graduating, she officially gained employment on June 4, 1984! Leigh Ann started in COR’s production areas, and worked on projects from dresser assembly to rope sewing! After five years in a variety of departments, she was promoted to Operations Director. She has remained in a management position since then, but never fails to pitch in whenever and wherever needed. Leigh Ann states her favorite thing about all her years at COR has been her coworkers. “We’re like a family – a very tight-knit group.” Also, she states that she’s seen many clients come and go over the years and many of them made a lasting impact in her life. Leigh Ann says she’s had many memorable moments at COR, but 3 stick out in her mind. COR staff and clients were in charge of gluing millions of feathers to Nerf footballs for the chicken scene in the movie Far and Away. For another contract, COR took in 6 MILLION POUNDS OF SQUASH to sort by size and weight. “It was a 24 hour operation!” And finally, in 2013, Leigh Ann went to Viet Nam with CEO, Tony Cline, on an exchange program. She had the opportunity to see what disability services are like on the other side of the world. Now, let’s get to the important questions! “If you were stranded on a desert island and could only take 3 things, what would they be?” My cat, Harley. A solar powered radio so I could listen to music. And Tom Hanks … he could make sure I survive by building shelter, a fire and a hammock. Depending on the comfort level, I might stay! “If I came to your house for dinner, what would you make me?” Shrimp Scampi "What is your least favorite thing about humanity?” Disingenuous people Leigh Ann enjoys golfing and travel. She has been to Mexico, Korea, Viet Nam, England and France. This entry was posted in Uncategorized on April 5, 2016 by Jodi Mackay. This entry was posted in Uncategorized on April 4, 2016 by Jodi Mackay.